Coal is a very important energy source in modern social. Coal storage on the earth is limited and coal is nonrenewable resources, so improving the efficiency of coal is very important. There are many methods to improve the coal use ratio, including coal grinding. Coal grinding is pulverizing the coal briquette into smaller before burning or processing. The coal briquette is transported to grinding mill by belt conveyor and feed into grinding mill by vibrating feeder. The coal falls down the center of grinding table from feed opening. 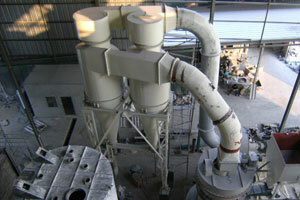 At the same time, hot air comes into the grinding mill from the air inlet. Due to the centrifugal force, coal move to the edge of the grinding table. The coal is pulverized by the roller when by pass of the groove on the grinding table. The grinded coal is brought up by vane high-speed airstream, the larger particles fall down to the grinding table for regrinding. When coal powder in the airstream passes the separator on the top of the grinding mill, the coarse coal powder falls down the grinding table for regrinding under the function of rotation rotor. Ball mill is common coal grinding mill and it has been used in coal grinding area many years. ZENT ball mill has exported to many countries and gets the customers’ praise. LM series vertical coal grinding mill is the newest grinding machine, which integrates the advanced international technology and years of mill-producing experience. It is ideal equipment that integrates crushing, drying, grinding and grading conveyor all together. LM vertical mill is your ideal coal grinding mill.